Than are dreamt of in your philosophy. .. The present being the second time the Melbourne Cup has been postponed on account of abnormally heavy rain storms, it is not inappropriate to recall the first occasion, upon which it was “held up” for exactly the same reason and also because it is associated with what is probably the most remarkable incident in the annals of horse racing and which is now a tradition of the Australian Turf. “Billy” Slack, one of the biggest double event “bookies” of his day, who was one of the party, good-naturedly offered to bet Mr Craig £1000 to eight, drinks that a horse named Croydon would not win the forthcoming A.J.C. Metropolitan and that his dream would not come true. The bet was taken and the drinks were consumed in advance. One morning shortly afterwards Mr Craig remarked to a member of his family: “Nimblefoot will win the Melbourne Cup, but I shall not live to see it.” And that, very night he died. 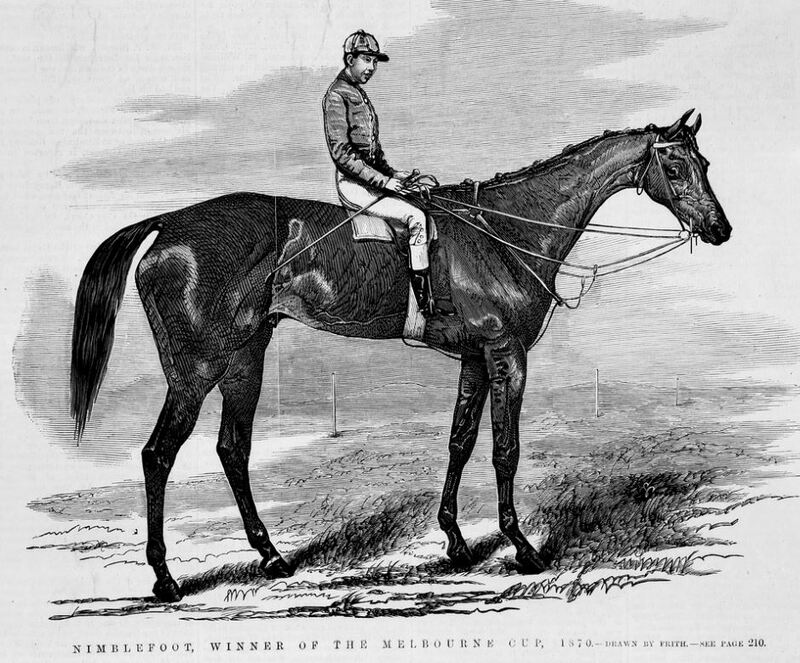 Croydon won the “Metro;” Nimblefoot won the Melbourne Cup by a short head and the jockey, young Day, wore a crape band upon his left sleeve, out of respect to the late owner of the winner Nimblefoot. Great was the regret in Ballarat that poor Walter Craig did not live to see his horse triumph. Of course, as Mr Craig had died in the meantime, all bets were off, but an act that will ever redound to the honor of “Billy” Slack the bookmaker, was that he paid in full the late Walter Craig’s widow £1000. This entry was posted in Animals, Death, Frolics, Gentlemen, Irregular Lives, News and Announcements, Sport, Supernatural, Victorian and tagged Australian race horses, Australian turf, Billy Slack, bookmaking, death omens, dreams of death, horse racing, Melbourne Cup, Nimblefoot, prophetic dreams, The Jockey Wore Crape, Walter Craig on May 5, 2017 by chriswoodyard.